From now on there will be a little video-editing happening from time to time - for the benefit of paid-newsletter subscribers next year. 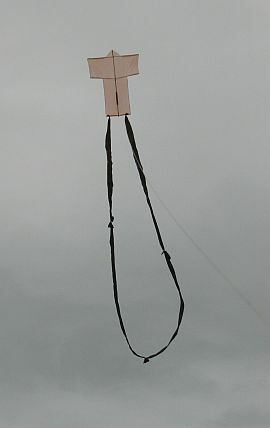 Hence a number of short clips were taken today, plus some close-up stills of the 2-Skewer Sode kite. By moving the anchor-point away from a large tree, the kite found enough air movement to stay a few meters up during gusts. On this short line length, some camera-work was done. Then about 30 meters (100 feet) of line was let out. Finally the kite was able to break free from the air-slowing influence of bushy trees upwind. Wind speeds up high were pretty ideal for the sode, averaging around 8 kph with gusts up to 13kph. More video was taken, from various angles. Then it was time to really fly free - up around 180 feet off the grass on 60 meters (200 feet) of 20 pound Dacron line. Although the sode seemed to be pulling to the right a little under pressure, it didn't stop the kite from taking advantage of rising air. There it was, floating almost directly overhead. Passing a single turn of the Dacron around my carry-bag sitting there on the ground was sufficient to anchor the kite. The block winder was left jammed against the upwind side of the bag. The vertical spar of bamboo BBQ skewers had taken on a bit of a twist due to the extended storage. So I twisted the kite back into shape as hard as I dared. The kite seemed straighter after that, although flight loads would keep it flat in the air. Hopefully! Some extra tail was added too, since the breeze was gusting much more than Light today. Sure enough, up the Sode popped and over it went to the right, when pushed hardest. The edges of the upper part of the sail curved a lot as the 2 horizontal main spars strained towards each other in that distinctive Sode way. But bamboo is tough and the skewers held firm. After shifting the bridle knot to the left by several millimeters, the bright orange Sode behaved better in the gusty and thermic conditions. On about 15 meters (50 feet) of line, some video was taken. Then it was time to get some serious height! With the line out to 60 meters (200 feet) the small Sode wandered about at between 60 and 70 degrees of line angle for most of the flight. As happened just days ago at this same reserve (with another kite), the Sode wanted to take a closer look at power lines. Wanting none of that, I quickly walked away to the other side of the reserve. Then followed a few glorious minutes just enjoying the sight of the kite soaring about almost overhead. The orange plastic belied it's age, being back lit by the sun to a glowing hue. The sky was completely blue. At one point I thought I spotted a small patch of cloud near the horizon - but it was the pale faintness of the moon in broad daylight! Being in the thick of re-doing the Paper Diamond e-book, it was going to be a while before the new colored Diamond was flown. Hence, today was a quick outing to at least fly something. It was going to be warm out there with an extreme fire-danger day coming up tomorrow. Aren had his small quiad-copter up and taking movies from it before I had the Sode hooked up and floating out on 20 pound Dacron. Due to the heat I had launched from some shade but it was soon clear that to get more line out I would have to move. So, after a brief stint on about 15 meters (50 feet) of line, I walked out into the furnace and flew on 30 meters (100 feet) for a while. It was rough up there, with thermal turbulence twisting and tossing the light-weight Sode all around. Occasionally the breeze would smooth out allowing the bright orange kite to float slowly upwards, nose-high. This small Sode does well in smooth and / or light winds on it's 3-point bridle. But a 4-point bridle would definitely help in rough air! A bit more tail would help too. Continuing to walk out and into wind, there was soon room to fly on 60 meters (200 feet). Which was done for just a couple of minutes. I couldn't remember ever flying this particular kite really high, so I ended up letting out 90 meters (300 feet) of the Dacron. No problem in a giant field of dry weed stubble, which was opposite a large multi-storey shopping complex on a similar-sized block. Up so high, the 2-Skewer Sode found slightly smoother air but had a hard time pulling most of the sag out of the line. Feeling the tension, I surmised that the kite would actually fly on polyester sewing thread - at least for a few minutes, in unpredictable air like this! Not wanting to spend too long out there dehydrating like peaches in a drier, I wound the 20 pound line back on to it's blocky solid-wood winder. Uncrushable! A large mass of low gray cloud had just passed over, accompanied by a freshening of the gusty light breeze through our back yard. Aren and I had taken out the 58cm (23") 2-Skewer Sode for a spot of white-knuckle roof-top flying. Flying over the roof-top that is, not from it! As it turned out, the kite did end up dragged into the gutter a couple of times, but it escaped injury. We both had turns flying while the other took some video on the camera. The last clip showed the kite being flown several meters over the roof, before a lull forces a pull-in of line. Which resulted in a nice close-up of the bright orange Sode as it floated down past the gutter and then hovered over our side lawn in a fortuitous puff of air. One of the dangers was getting the loop tail caught on the TV aerial, but the Sode managed to evade that one. Another danger was swirling air looping the kite onto the roof tiles. That did happen once! On another occasion, Aren allowed the kite to sink out onto the flat verandah. But each time it was possible to gently prise the kite out of the gutter after it got pulled there by the flying line. The 2-Skewer Sode kite is now safely back on the wall in the living-room. Last time this kite went out, it was a test of its light-wind capabilities. Today was the very opposite, with gusts at shoulder-height reaching 24kph! For the first 20 minutes or so I just played around with bridle settings, to learn a bit more about the characteristics of the new 2-Skewer Sode. Turns out it doesn't respond well to forward towing points at all, as a remedy for higher winds. Instead, it seems to fly better on the same setting which works well for the lightest flyable winds. With the more aft position for the bridle knot, the extra air pressure seems to make the kite fly steadier and more stable. The frame is distorted in a way which keeps the nose pointing upwind. Mainly, I think this is the lower horizontal spar getting more dihedral in flight than the upper one - which has two bridle attachment points on it. I also tried shifting the upper bridle-loop knot quite a way to the left then to the right. Surprisingly, the expected looping did not occur! So it's not much use for trimming the kite left or right. It seems the single lower bridle attachment point is letting the lower spar float into a position that negates the trimming. This particular kite seems to be quite nicely trimmed already, but if necessary, a short 'tail-let' off one wing tip would correct a turning problem. Mind you, the Dowel Sode, with its 4-point bridle keeping the frame more rigid, is beautifully trimmable. Small changes in the upper bridle-loop knot do the trick! After this I just played around with the kite on 30 meters (100 feet) of line. Occasionally it would get forced down in wide arcs to near the ground, during the fiercest gusts. At other times it would soar overhead in rising air, the strong sunlight lighting up the sail in brilliant orange. Wonderful. The outer portions of the upper sail can sometimes curl up to a ridiculous extent under pressure, with skewer tips on the same side moving towards each other. Yet the kite keeps flying well, if squashing down a little in terms of line angle. A peculiarity of Sodes. According to the wind meter, the average breeze was 9.6kph with the already-mentioned max gust to 24kph. No great altitudes flown today, but fun never-the-less! After getting be-calmed yesterday, today was looking much better for seeing what the little paper Sled could do on a generous length of polyester sewing thread. However, down at the reserve, the gusty breeze uncovered a problem. The Sled had been hanging on a wall in our hallway for so long that the paper had set in the closed position. All curled up so the towing points touched. In every lull, the towing points would snap together again, causing the kite to spin and drop. Pity. But nothing an ordinary household iron wouldn't fix! So I ironed it flat when I got home, ready for another attempt. This time I wasn't caught out without a backup kite. The 2-Skewer Sode was it for today. A little earlier, the wind meter had registered an average wind speed of around 8kph and gusts to 18kph at shoulder height. Just enough to generate some leaf noise from the nearby tree. The Sode immediately popped into the air and I flew it around on just a few meters of line while taking video. Then it was straightforward to move upwind towards the far side of the grassed area while letting out more line. At 60 meters (200 feet), out came the camera again for some more video. 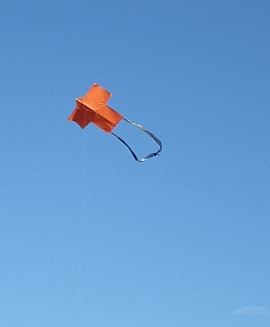 The orange-sailed Sode kite was flying about, experiencing wind speeds all over its comfort range. For a while it just sat up there, almost stationary, during a period of smoother breeze. Later, on 90 meters 9300 feet) of line, comfort turned to stress and strain as the thermal gusts grew stronger. At wind speeds around the mid-twenties in kph, the 2-Skewer Sode goes to one side and will do a complete loop if pushed any further. Patches of moderately strong sinking and rising air affected the kite, causing it to drop and pull hard before flying way overhead at other times. A very enjoyable flight, with the mid-sized kite really showing off on its long light Dacron line. In the almost cloudless sky, the sun lit up the bright orange sail from behind. The Sode would have been spotted by dozens of motorists in the area. Puzzled by its shape no doubt, since it's not a Diamond or a Delta! A short and somewhat frustrating session yesterday as a very light breeze got even lighter. With the 2-Skewer Sode on hand, light winds were covered. Or so I thought! When very light winds are combined with a lack of thermal activity (convection), no kite will stay up there. No less than four opportunities went by to video the kite flying with a passenger jet passing by in the same region of sky. Each time, the bright orange Sode was on the ground. Never-the-less, a number of short flights were obtained as I worked the 20 pound Dacron line in and out to maximize the flight time. The maximum height obtained was only 100 feet or so. Wind meter reading? Didn't bother, since it would have sat there with the tiny cups motionless most of the time! The 2-leg bridle of the original 2-Skewer Sode kite had been replaced with a 3-leg one. The idea being that the bridle loop would allow for convenient trim changes, in case the kite pulled one way or the other under pressure. Hence one leg went to the vertical spar near the nose while the other two went to the lower horizontal spar, almost halfway out to the tips. Well, the Sode flew like a dog! Unstable as anything, and even a long tail didn't do much. I soon realized my mistake - the upper horizontal spar was free to flex much more than the lower one. At the risk of getting a little technical, dear reader, this meant the tips would often go to a higher angle of attack than the mid-section of the cambered 'wing' of the kite. A 'tip stall' on one side or the other would then be likely to happen. Result: a violent twist in the direction of the stalled tip. It was handy that the bridle lines had not yet been fixed with glue. So it was easy to loosen and remove the lines from the lower horizontal spar. After attaching both lines to the vertical spar instead, I tried again with the resulting two-leg bridle. The extremely gusty wind conditions were not helpful, but this time the kite flew better. At least most flights were now measured in minutes rather than seconds! The next flights will be with a 3-leg bridle again, but with the loop attached to the upper horizontal spar. Maybe a looped tail as well, since it would be a natural fit to the square tail end of the kite. Near the ground the wind meter registered gusts to 12.8kph. However, medium level cloud was scooting past at a much faster rate. Dense shadow alternated with bright sunshine too, so patches of rising and sinking air were everywhere. With rather too much wind speed for most of my larger light-wind kites, it struck me that it wouldn't hurt to take out a little 1-Skewer kite for a change! So, several were put in the car - the Rok, Sode and Dopero, all with generous tails. An awkward landing dislodged the the upper horizontal spar's glued join with the vertical spar. On top of that, the UV-affected plastic sail cracked all the way back to the lower horizontal spar. A minute later, with a few carefully placed pieces of sticky tape in place, the Sode took to the air. Surprisingly, it flew quite well! On just several meters of line, I took a number of videos. Just one will be selected to keep. After a few flights, the 20 pound Dacron line was let out to just over 30 meters (100 feet), to see what the tiny Sode would do. The damage and repairs had cut the top end of the kite's wind range considerably, but at times the wind speed was just enough to coax the tiny kite up to a 35 or 40 degree angle. The Dacron being a little on the heavy side for this kite, there was considerable sag in the line. A couple more videos were taken. Then I held the wind meter up above shoulder height for half a minute. 13kph gusting to 22kph. However, it had seemed a bit fresher earlier. And of course the kite was up in faster air at about 50 feet off the grass at times. 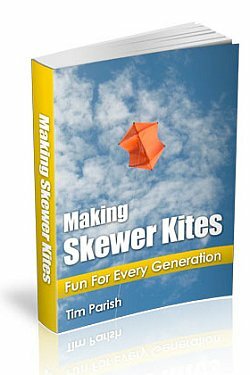 So, some 1-Skewer kite action for old time's sake!